Fine and rare old English mahogany revolving book table on a revolving base terminating in Queen Anne style cabriole legs; please note pierced sides. 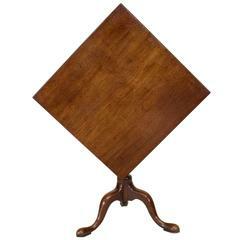 A 19th century English Queen Anne mahogany pedestal table on a tripod base. 18th century English Queen Anne mahogany pedestal base tilt-top end table with a square top supported on three legs. Nathan Margolis Queen Anne style mahogany end table. Pair of blond birch Mid-Century Modern X-base end side tables with magazine rack. High quality American made carved mahogany side table with slide out cup or candle holders by Kittinger Williamsburg Galleries collection. 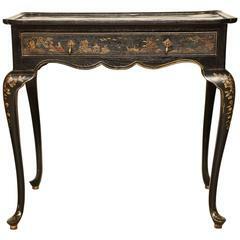 Queen Anne black lacquered chinoiserie decorated tea table with single frieze drawer on cabriole legs.